Thirty years ago if you wanted to print something from a computer, your main choices were a high-quality but expensive and quite large laser printer, or a cheap but slow, clunky and incredibly noisy dot matrix printer. If these didn’t work for you and you still needed high-quality printing you might still have to resort to an old-fashioned daisy wheel printer instead. But there was another option, and in February 1988 Hewlett-Packard introduced the HP DeskJet – a desktop printer with quality almost as good as a laser printer but for a fraction of the price. 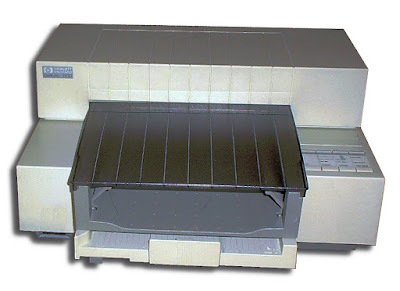 It wasn’t the first inkjet printer, and indeed HP themselves had been marketing the ThinkJet range for several years, but that was little more than a dot matrix printer with an inkjet head in it. Like laser printers, but unlike most dot matrix printers and even the ThinkJet range, the DeskJet was built only to handle cut sheet paper. Compact enough and quiet enough to be sat on a desk next to a computer, the DeskJet was ideally suited to small offices or home environments. It was an immediate hit with customers. Early DeskJets were not without their problems. A lot of office paper was designed for typing or photocopiers, and some coped poorly with the ink from inkjet printers. Complex graphics could be a problem on early units due to hardware and software limitations, and although rated at the same 300 dpi as HP’s laser printers, even in the best cases the quality did not stand up to a close comparison. The water-based ink tended to take a long time to drive and would run if the paper got wet. But at around a third of the cost of a LaserJet II, the DeskJet seemed a good value proposition. But then (as know) one of the drawbacks of inkjet printing was the price of cartridges. Inkjet printing was much more expensive than laser printing, and those slow and noisy dot matrix printers cost next to nothing in ribbons. However, thirty years later these ink cartridges are still available with prices at around £30 to £50. Subsequent generations of DeskJet added colour, network printing, full duplex capability and more. These days you can buy an HP DeskJet 2130 multifunction printer for around £40, although a replacement set of ink cartridges for than will cost more than £20. The lasting commercial success of the DeskJet range is remarkable and it certainly introduced a significant step forward in affordable printing for many people.